British newspapers are undeniably powerful. Politicians seek the support of influential editors and publishers to ensure a good press, while the titles look to influence who gains or loses power. Some papers have even taken direct credit for election results, with The Sun famously claiming ‘It's The Sun Wot Won It’ after the Conservatives' unexpected victory in 1992. More than 25 years on from that headline, the editor of the relaunched socialist magazine Tribune believes the media’s influence on politics is still as strong, particularly from the Right. "Right-wing newspapers' ambitions are clear - they want to ensure power continues to rest where it does in British society," Ronan Burtenshaw told ITV News. "They want to make sure that people who have wealth keep it and extend it. They want to make sure that marginalised communities continue to face oppression." Jeremy Corbyn is no stranger to unflattering headlines from the right-wing press. He attacked the "the billionaires who own the bulk of the British press" who "don’t like us one little bit" in his speech to the Labour Party Conference in Liverpool. Meanwhile, shadow chancellor John McDonnell began his conference address by paying tribute to the Labour leader's "dignity" in the face of attacks from "our friends in the media". Mr Burtenshaw told ITV News while he disagreed with the right-wing message he believed the method could provide a lesson for the left-wing media to learn. "They want to make sure the Tories stay in power… they know what their mission is," he said of the anti-Corbyn press. "The question for those of us on the left of British media - do we know what our mission is? "Are we strong enough for making our case for socialist politics and an alternative to the Tories and right-wing politics." 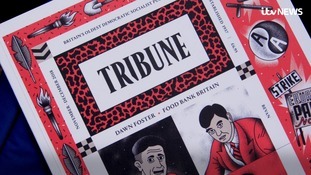 Tribune was founded in 1937 as an anti-fascist publication and its editors have included the likes of Labour's NHS architect Aneurin Bevan and former leader Michael Foot. The magazine has relaunched at this year’s Labour Party Conference to attempt to provide the alternative perspective Mr Burtenshaw claims is lacking in the modern media landscape. "Tribune is relaunching because we believe we have not been strong enough," he said. "We believe the Left media needs to grow, needs to (be) better and make those cases for socialist politics and socialist society more clearly."